I think u get it already since d first time u read d title. 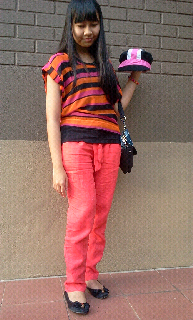 With the same red tapered pants i show u in d previous post,yesterday i matched it with woven top from Forever 21. Then i wore a black n pink n white stripe cap. (i went to jln TAR n it was too sunny so it was suitable to wear a cap yesterday). Last but not least a black momoe handbag, a colourful bracelet and also a ballet/flat shoes from Vincci!